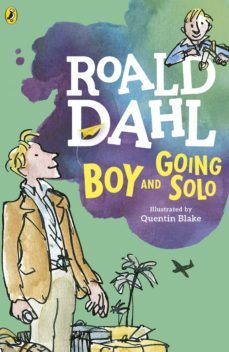 Boy and Going Solo is the whole of Roald Dahls extraordinary autobiography in one volume. Roald Dahl wasnt always a writer. Once he was just a schoolboy. Have you ever wondered what he was like growing up?In BOY youll find out why he and his friends took revenge on the beastly Mrs Pratchett who ran the sweet shop. He remembers what it was like taste-testing chocolate for Cadburys and he even reveals how his nose was nearly sliced off.Then in GOING SOLO youll read stories of whizzing through the air in a Tiger Moth Plane, encounters with hungry lions, and the terrible crash that led him to storytelling.Roald Dahl tells his story in his own words - and its all TRUE.And now you can listen to all of Roald Dahls novels for children on Roald Dahl Audiobooks read by some very famous voices, including Kate Winslet, David Walliams and Steven Fry - plus there are added squelchy soundeffects from Pinewood Studios! Also look out for new Roald Dahl apps in the App store and Google Play- including the disgusting TWIT OR MISS! and HOUSE OF TWITS inspired by the revolting Twits.